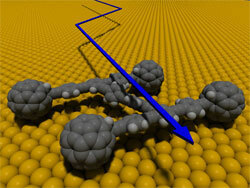 Nanocars evolved from research that began over a decade ago. At the IBM Zurich Research Laboratory, synthetic molecules (S-molecules) on a metal substrate were moved in a controlled and repeatable manner by pushing them with the tip of a scanning tunneling microscope (STM). See http://domino.watson.ibm.com/comm/wwwr_thinkresearch.nsf/pages/moving196.html .